Two weeks in a row, an already seemingly strong film has blown away expectations at the box office. Do this a third time and it's over between us, America. 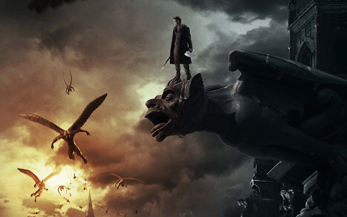 I, Frankenstein is the sole new wide release of the weekend, falling back into the typical “January doldrums” that the month is stereotyped to have, even though more lately it's been a stealthily strong slate of films. Produced by the Underworld crew, it takes that series' blue-hued, effects-heavy gothic action horror style and applies it to Frankenstein's monster. Aaron Eckhart (who you probably assumed was past needing to do this sort of thing) plays the lead role as Frankenstein's creation that has somehow survived several hundred years (because why not) and is in the middle a war between gargoyles and demons. Those are two totally different things why would you say they're not! At the very least, this gave Eckhart an excuse to get really ripped and jump in front of green screens while trying not to look totally ridiculous (Spoiler alert: he does). This is the kind of bloated CGI-laden action that has gotten both dime-a-dozen and boring beyond belief, with actors yelling out stilted action cliches, then being flung around on wires carrying prop weapons that don't make a whole lot of sense. Bill Nighy seems to be having a bit of fun, at least, as a scenery-chewing villain, but Eckhart, along with co-stars Yvonne Strahovski, Miranda Otto and a group of relative unknowns seem to be taking this all too seriously to make it any good. It's the kind of dour, high-drama take on the material that eventually killed the Underworld series, and it hasn't improved any with this switch. Perhaps they meant us to laugh at, but I have my doubts. Eckhart is no Kate Beckinsale (I estimate a full 50% of the ticket sales for Underworld were corset fetishists), and this seems doomed to a fate of the dollar bin rather quickly. Opening in 2,700 or so venues, it should open to around $12 million. That Ride Along was a hit should not have been a surprise to anyone – Kevin Hart was due for a breakout and the pairing with Ice Cube made a lot of sense – but the magnitude to which it did surely turned a few heads. Earning $41 million in its debut, it set a January record and established Hart as a box office force to be reckoned with. It also sets a bit of a template for comics to follow in their own breakout attempts – pick a tried and true buddy comedy genre and make it as generic as hell. This lets comics put their own stamp on the material and keeps the quality of the film out of the way. It's what worked so well for Eddie Murphy, but it's taken a long time to rediscover this fact. In its second weekend, Ride Along will probably fall pretty steeply, to around $23 million, but that's little problem after that debut. Lone Survivor is the other big surprise of January, with around $80 million in the bank after two full weeks. The Afghan War film (and, it must be said, double Oscar nominee) is fulfilling a little-served demo, and quality war films that are actually about military actions are hard to come by. This should fall to around $12 million this weekend, on its way to around $125 million total.